There are many things to consider when displaying fine art on board but, perhaps more important than anything else, is to brief your interior designer with your artistic tastes, the pieces already in your collection and the pieces you are considering buying so your favourites will always be in pride of place. American interior designer Suzanne Lovell has years of experience in this area and recently undertook the renovation of a penthouse in a pre-war residence overlooking Lake Michigan. The property was initially designed by architect Howard Van Doren Shaw and now belongs to a prominent art collector who briefed Lovell to retain and restore the original features of the penthouse while reviving the residence's interior beauty with period furniture and, of course, their own art collection. Here Lovell takes us through the inspiration and process behind this stunning transformation. The Gallery The gallery features a gracefully arched and coffered ceiling which the team raised to achieve a grander scale and, being the entrance to the property, set the stage for elegance throughout the residence. The high gloss Venetian plaster walls, arched plaster ceiling and Nero Portoro marble floor not only balance one another but emphasise the refined setting. The wrapped leather chandeliers are inspired by Jacques Adnet and were created by the team in collaboration with Mathieu Lustrerie while Art Deco lamps in alabaster and nickelled bronze grace a De Coene Frères sideboard from the 1930s. Idolo by Wifredo Lam and a 1953 brass kinetic sculpture, Construction by Sidney Gordin, further complement the space. An important pair of Jansen Modernist consoles circa-1950s are placed opposite the Frères sideboard, adding to the visual balance of the gallery. The south wall holds Campo Amor Vist Oeste, Havana, Cuba by Andrew Moore, illustrating the remains of a bygone era. There are many things to consider when displaying fine art on board but, perhaps more important than anything else, is to brief your interior designer with your artistic tastes, the pieces already in your collection and the pieces you are considering buying so your favourites will always be in pride of place. American interior designer Suzanne Lovell has years of experience in this area and recently undertook the renovation of a penthouse in a pre-war residence overlooking Lake Michigan. The property was initially designed by architect Howard Van Doren Shaw and now belongs to a prominent art collector who briefed Lovell to retain and restore the original features of the penthouse while reviving the residence's interior beauty with period furniture and, of course, their own art collection. Here Lovell takes us through the inspiration and process behind this stunning transformation. The gallery features a gracefully arched and coffered ceiling which the team raised to achieve a grander scale and, being the entrance to the property, set the stage for elegance throughout the residence. The high gloss Venetian plaster walls, arched plaster ceiling and Nero Portoro marble floor not only balance one another but emphasise the refined setting. The wrapped leather chandeliers are inspired by Jacques Adnet and were created by the team in collaboration with Mathieu Lustrerie while Art Deco lamps in alabaster and nickelled bronze grace a De Coene Frères sideboard from the 1930s. Idolo by Wifredo Lam and a 1953 brass kinetic sculpture, Construction by Sidney Gordin, further complement the space. An important pair of Jansen Modernist consoles circa-1950s are placed opposite the Frères sideboard, adding to the visual balance of the gallery. The south wall holds Campo Amor Vist Oeste, Havana, Cuba by Andrew Moore, illustrating the remains of a bygone era. Original English oak millwork was darkened, extending the dialogue of balance and sophistication into what came to be called the Ebony room. Dagobert Peche’s large scale, cubic-form bergères, inlaid with Bakelite and produced for the Austrian villa of Toscana Gmunden bookend an intimate furniture grouping placed before the limestone fireplace. The sofa is in Macassar ebony and inspired by an example by Josef Hoffmann at Palais Stocklet in Brussels while the circa-1920 grey and white striated marble coffee table is by Edgar Brandt. We chose a 1940s “diamante” glass pendant by Italian firm Venini & Co to light the grouping — the size and height of the chandelier brings an intimate scale to the room. 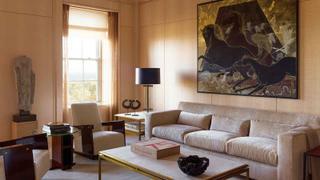 The black and taupe silk custom carpet was designed by Suzanne Lovell Inc. with Orley Shabahang. Original English oak millwork was darkened, extending the dialogue of balance and sophistication into what came to be called the Ebony room. Dagobert Peche’s large scale, cubic-form bergères, inlaid with Bakelite and produced for the Austrian villa of Toscana Gmunden bookend an intimate furniture grouping placed before the limestone fireplace. The sofa is in Macassar ebony and inspired by an example by Josef Hoffmann at Palais Stocklet in Brussels while the circa-1920 grey and white striated marble coffee table is by Edgar Brandt. We chose a 1940s “diamante” glass pendant by Italian firm Venini & Co to light the grouping — the size and height of the chandelier brings an intimate scale to the room. 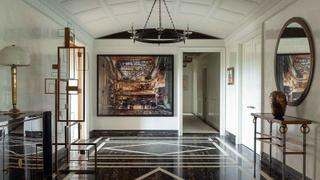 The black and taupe silk custom carpet was designed by Suzanne Lovell Inc. with Orley Shabahang. Opposite the Ebony room is the Ivory room, which offers sumptuous seating and illustrates the client’s desire for perfection. This sitting room is clad in the whitest natural log of English Sycamore available worldwide. The consistent rhythm of markings on the veneer allowed the millwork to be matched in sequence lending a subtle, sophisticated pattern to the walls. The expression of textures continues in the pair of mahogany sleigh armchairs by André Sornay, studded with his signature clouté technique and finished with wraparound upholstery of natural shearling. The mahogany side table, circa-1937, is also by Sornay. The velvet sofa is after Jean-Michel Frank and the coffee table and side table are by Richard Shapiro. The powerful Japanese folding screen is a mid-twentieth century view of horses and cranes at Mt. Fuji. Opposite the Ebony room is the Ivory room, which offers sumptuous seating and illustrates the client’s desire for perfection. This sitting room is clad in the whitest natural log of English Sycamore available worldwide. The consistent rhythm of markings on the veneer allowed the millwork to be matched in sequence lending a subtle, sophisticated pattern to the walls. The expression of textures continues in the pair of mahogany sleigh armchairs by André Sornay, studded with his signature clouté technique and finished with wraparound upholstery of natural shearling. The mahogany side table, circa-1937, is also by Sornay. The velvet sofa is after Jean-Michel Frank and the coffee table and side table are by Richard Shapiro. The powerful Japanese folding screen is a mid-twentieth century view of horses and cranes at Mt. Fuji. 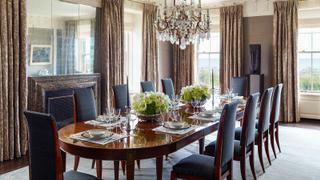 Graceful design and furnishings carry into the dining room. Surrounding the client’s dining table by Le Corbusier and Pierre Jeanneret from Chandigarh (c. 1936) are a set of 1930s Art Deco rosewood dining chairs by Maurice Jallot. The blue horsehair upholstered dining chairs add a historic reference while also creating a crisp aesthetic that will wear well. Astride each window are richly designed Fortuny drapes which hang just beneath the dentil moulding to showcase the height of the room. In front of the silk upholstered walls at the east end of the room a Modigliani sculpture rests atop a plinth with sombre strength and simplicity. Mirror panels in antiqued silver were installed above the fireplace, visually extending the room and creating a seemingly larger space to reflect the length of the living room beyond. Graceful design and furnishings carry into the dining room. Surrounding the client’s dining table by Le Corbusier and Pierre Jeanneret from Chandigarh (c. 1936) are a set of 1930s Art Deco rosewood dining chairs by Maurice Jallot. The blue horsehair upholstered dining chairs add a historic reference while also creating a crisp aesthetic that will wear well. Astride each window are richly designed Fortuny drapes which hang just beneath the dentil moulding to showcase the height of the room. In front of the silk upholstered walls at the east end of the room a Modigliani sculpture rests atop a plinth with sombre strength and simplicity. Mirror panels in antiqued silver were installed above the fireplace, visually extending the room and creating a seemingly larger space to reflect the length of the living room beyond. 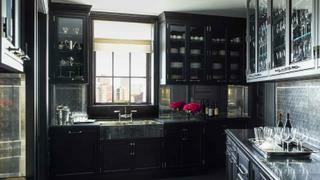 The sunlit dining room opens into the ebonized Butler’s pantry. The custom German silver sink serves as an embellishment to the millwork and hardware. The Butler’s pantry stylishly supports both the dining room and kitchen. A graciously appointed kitchen features a crisp and balanced palette of black and white. 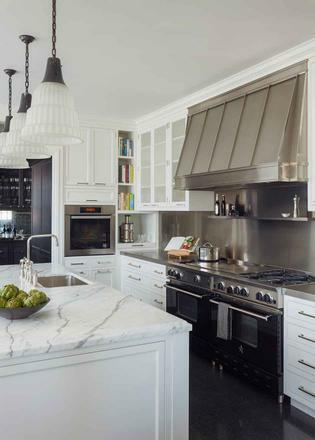 The floor is black terrazzo while the countertops and backsplash are statuary marble and the custom range hood is in stainless steel with a standing seam. This kitchen boasts a generous space, wonderful for gourmet chefs and family gatherings alike. For the master bath, Arabescato Cervaiole and Bardiglio stone were selected, painstakingly cut and placed to offer precisely aligned veining on the full height marble walls. 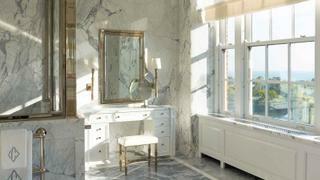 Both the shower enclosure and dressing table offer breathtaking views. Opposite the dressing table are custom designed vanities with Palladium leaf mirrors and nickel grill detailing that bring a fresh take to classic design. The master bathroom is finished with a pair of Delisle of Paris medicine cabinets.